Inside Wisconsin's State Capitol on Wednesday, July 24. 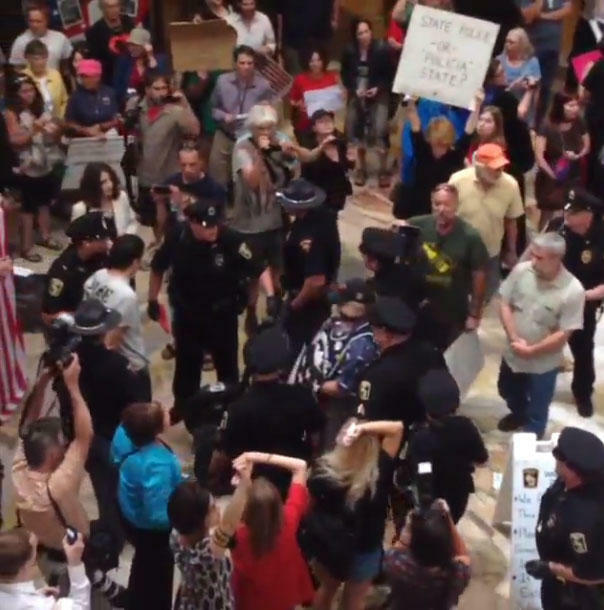 The threat of arrest and $200 citations has not deterred protesters at Wisconsin's Capitol. This week, the Walker administration began cracking down on those without a permit. On Wednesday, state police began arresting demonstrators during what has become a noontime sing along, since massive protests occupied the Capitol in March of 2011. At that time, most people rallying opposed the governor's cutbacks in public union rights. In the time since, those gathering have been critical of Republican policies, in general. The administration enacted rules months ago, requiring any group larger than three people to obtain a permit in order to demonstrate. Earlier this month, a federal judge temporarily upped the number to 20 or more, and this week, Capitol police began enforce the rule. Protesters insist they have free speech rights and the right to assemble. The governor's office says it must maintain order at the Capitol and would grant the demonstrators a permit, if they applied. On Wednesday and Thursday, officers cited nearly 50 people for breaking the rule. During the noon hour Friday, nearly a dozen more were taken away. Each day, the number and volume of protesters, have grown.